Why should kids have all the fun? 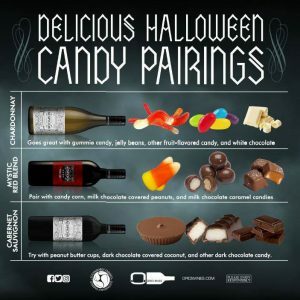 Pair your favorite Auspicion wine with candy! Auspicion Chardonnay – Great with gummie candy, jelly beans, other fruit-flavored candy, and white chocolate. Auspicion Mystic Red – Pair with candy corn, milk chocolate covered peanuts, and milk chocolate caramel candies. Auspicion Cabernet Sauvignon – Try with peanut butter cups, dark chocolate covered coconut, and other dark chocolate candy.